The Liberty Head V Nickel (also called Liberty Head Nickel) that has a readable date is worth at least fifteen times their face value (seventy-five cents) unless it are badly damaged or almost totally worn out. Some Liberty Head V Nickels, called key dates, are worth hundreds, even thousands of times their face value. The prices in this table are approximately what Belleair Coins will give you for average grade coins of the type typically found in old jars, shoe boxes, “unsorted lots,” etc. If your coins are uncirculated, or have very little wear, the value could be 10 to 12 times as high or more. 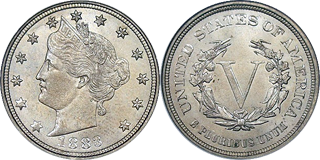 The mint mark, if the coin has one, is right below the dot to the left of CENTS on the reverse, near the 7 o’clock position.